Simple, elegant and lightweight, these earrings will easily become favorite everyday options. 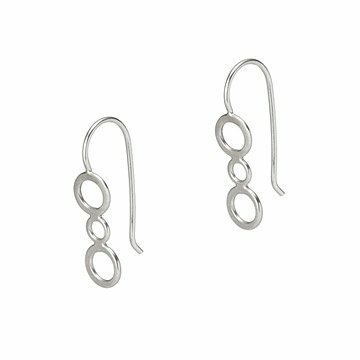 Simple, elegant and lightweight, these earrings will easily become your favorite everyday options. Carol Joannidi hand forms, hammers, and solders silver circles in subtle cascades that are light and delightfully wearable. Hypoallergenic backings included. Handmade in Holyoke, Massachusetts. I would buy this product again. Beautifull! Earrings are attractive and a good length for her hairstyle.